If not, then it's time for a renovation. A kitchen remodel can be inspired by lifestyle changes, the need for energy efficiency, upgrading of decades-old styling, or simply that you are ready for a change. The good news is that remodeling the most used room in your house not only improves the space itself, it increases the overall value of your home. * Replace your faucet. For the amount you use your kitchen faucet, functionality and ease-of-use should be top priorities - highlighted with stylish designs lines, of course. 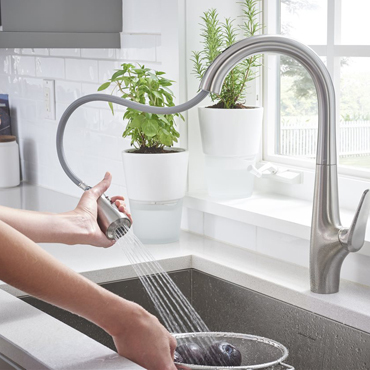 The Avery Selectronic hands-free pull-down kitchen faucet from American Standard features a three-function spray that can handle any kitchen challenge. Plus, this high-arc touchless faucet offers flexibility to suit user preference - simply switch to manual function for guests not familiar with touchless operation. * Add a backsplash. Create an instant wow factor by enhancing the walls above the work areas of your kitchen. The use of varying shapes and materials can really showcase your creative side. Today's homeowners are choosing larger sized subway tiles, introducing a bit more color to this traditionally neutral-colored area of the kitchen, experimenting with varying tile patterns, and choosing metallic and mirrored finishes. Extending the backsplash all the way to the ceiling, with the use of shelving instead of cabinets for storage, is a new trend gaining ground. Whatever your choice, a new backsplash can delight you every time you enter the kitchen. * Elevate your faucet. For homeowners who enjoy crafting delectable meals for family and friends, an upgrade to the GROHE Essence semi-pro faucet provides the perfect combination of modern functionality and high style. It features convenient one-hand operation, full 360-degree sink mobility and two high-performance sprays. Plus, this high-arc faucet features a flexible silicone hose that can be easily replaced in a variety of rainbow colors for an instant kitchen "perk-up." * Explore sink options. Whether it's for food preparation, dish washing or bathing a small child, families depend on the kitchen sink for a lot of things. The DXV Hillside stainless steel sink exhibits the rich character of popular farmhouse sink styling with a refined sophistication ideal for the modern kitchen. Made from 16-gauge stainless steel, its clean apron-front design makes it perfect for under-counter, flush countertop or above-counter custom installation. The result is a high-style sink that can meet any kitchen need. * Change out those cabinets. While repainting cabinets can change the look of your kitchen, replacing them can totally upgrade the room's core style and functionality. Select new cabinets based on the current needs of your kitchen, considering accessories that can improve functionality. Think slow-close drawers and doors, turntable corner cabinets, pull-out trash can cabinets, plus many innovative storage features. The choice of design styles - framed or frameless - will impact your kitchen's look. Cabinets vary in price, depending on whether they are stock, semi-custom or custom. With kitchen cabinets accounting for up to 40 percent of a full kitchen remodeling budget, invest time in choosing the style and function that will make you love your new kitchen. Whatever your level of kitchen remodeling, these upgrades are sure to make life easier and more enjoyable in a room that is the focal "living" room in any home. Go ahead and plan your renovations today - and experience the benefits for years to come.